HOUGHTON – Michigan Technological University will lead a team of experts in evaluating the economic and environmental impacts of a “worst case scenario” spill or release from the Line 5 Straits Pipelines. 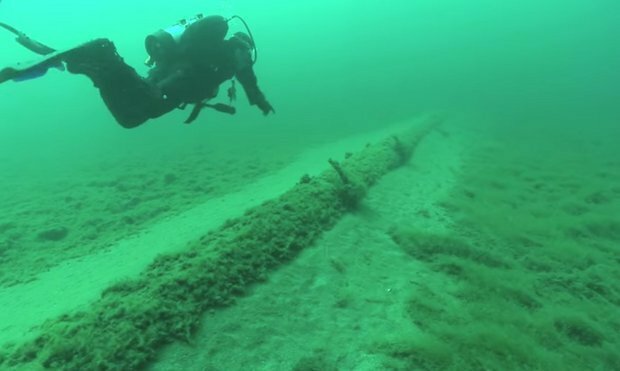 The State of Michigan announced Friday that it reached a contract agreement with Michigan Tech to have Guy Meadows lead an independent risk analysis of the two parallel 20-inch pipelines that form the 4.5-mile section of Line 5 that runs beneath the Straits of Mackinac. Meadows is the Robbins Professor of Sustainable Marine Engineering and director of the Great Lakes Research Center at Michigan Tech. The Agency for Energy (MAE), Attorney General’s Office (AG), Department of Environmental Quality (DEQ) and Department of Natural Resources (DNR) signed the contract with Michigan Tech. The environmental fate and transport of oil or other products released from the Straits pipelines in a worst-case scenario. How long it would take to contain and clean up the worst-case release. The short- and long-term public health and safety impacts. The short- and long-term ecological impacts. Potential measures to restore the affected natural resources and mitigate the ecological impacts. Estimate the amount of natural resource damages, the governmental costs, and all other economic damages – public and private – that would result from a worst-case release. When the team’s final report is issued, the State will require Enbridge Energy Limited Partners, which owns and operates Line 5, to maintain an adequate financial assurance mechanism to cover liability for all damages or losses to public and private property in the event of a worst-case scenario. The State has the authority to do so under the 1953 easement that granted permission for the pipelines’ construction. The risk analysis will be paid for by funds in an escrow account the State controls and which was set up in August 2016. The funds were provided by Enbridge, but the company has no say in how the money is spent or in the findings of the independent report. On Sept. 18, 2017, the Michigan Pipeline Safety Advisory Board (PSAB) unanimously recommended that Michigan Tech organize and lead state universities in an independent risk analysis of the Straits Pipelines. Last month, Meadows—who served on the PSAB as the state university representative before resigning to undertake the risk analysis—provided the PSAB with an update on the risk analysis proposal. After incorporating feedback from the PSAB and the State’s technical team, Meadows and his team submitted a final proposal to the State in mid-December. The parties finalized their contract agreement on January 12. Meadows has organized a team of 41 researchers, 21 from Michigan Tech and 20 from external organizations. Nine universities are contributing to the analysis, and seven of those are within the state of Michigan. They include Michigan Tech, the University of Michigan, Michigan State University, Wayne State University, Western Michigan University, Grand Valley State University and Oakland University. The two out-of-state universities are North Dakota State University and Loyola University Chicago. The risk analysis team is organized into nine sections, based on the State’s published scope of work. Each section has a section leader, a chief scientist and at least two section authors. In addition to the nine sections, a “broader impacts” team will provide a comprehensive overview of risks that various affected communities perceive in connection with the Straits pipelines. Affected groups include indigenous communities; local, state, federal and Canadian government officials; environmental and historic preservation groups; and tourism, fishing and recreation industries. The risk analysis team will use the Michigan Tech high-performance computing cluster, and researchers will develop a multi-layer, web-based GIS portal to accumulate output from each team. This portal will be made available to the State upon completion of the risk analysis to serve as rapid response resource inventory. Barring any setbacks, the team will complete a draft risk analysis and hold a public presentation on the draft report in July 2018, followed by a 30-day public comment period that would end in mid-August. After responding to public and State input on the draft, the team would prepare a final report to be delivered by September 15, 2018.